Proposed KZN Aviation Strategy "Growing Air Services and Connectivity"
The proposed KwaZulu-Natal Aviation Strategy, prepared by the KZN Treasury Crack Team, February 2014, is a response to an appreciation of the benefits of KwaZulu-Natal"s regional airports, as well as recognition of the need to develop the aviation industry in the province. There are nine regional, or secondary, airports in KwaZulu-Natal owned and operated, under various arrangements, by municipalities. All of the airports offer a general aviation facility but infrastructure and services vary greatly. Pietermaritzburg and Richards Bay provide regular scheduled services to OR Tambo International Airport (ORTIA), while Margate and Ulundi offer a less regular service, also to ORTIA. Newcastle is in the process of establishing a similar operation. In addition, there are approximately 20 landing strips of strategic importance scattered around the Province. For example, airfields at Himeville, Kokstad, Manguzi and Hluhluwe all play a critical role in the delivery of emergency services. The need for a regional aviation strategy arose because many of these municipal airports and landing strips became isolated and neglected, losing connection to national and international air routes. The airport authorities acted independently, without cooperation on development of infrastructure, air routes, feeder routes, services or promotion and advertising. There is no common policy, or consensus, on how to promote tourism or associated commercial developments. A long term strategy requires safe access to basic air services, runway extensions and new, or upgraded airstrips. General aviation hangars, fuel facilities and navigational aids are urgently needed. All municipal airport authorities experienced difficulty in formulating strategies to renew infrastructure, access funding, establish air routes and contract air carriers. Management of many of the municipal airports has presented an on-going problem. This is a specialized function because of the need for a high level of safety and security for aircraft and passengers. Municipalities show a lack of understanding of the business constraints faced by aircraft operators. Financially viable operations require high level frequencies and load factors, with aircraft spending as much time as possible flying and not parked at an airport. Runway upgrade, extension of terminal and apron, new navigational systems, revised master plan, introduction of an additional scheduled air carrier (SA Express) to ORTIA. New circle and by-pass, new navigational equipment, introduction of an additional scheduled air carrier (SA Airlink) to ORTIA. Runway upgrade and revitalization, new navigational equipment, new fire tender, establishing an air route to ORTIA, Pietermaritzburg and Virginia (Federal Air). Preparation of documentation and plans for upgrading and developing the airport precinct. The creation of a network of KZN airports, connected to ORTIA and KSIA hubs, that sustainably, efficiently and effectively, provides commercial, private and public service air routes, connecting economic and administrative regions to each other and to national and international air routes. 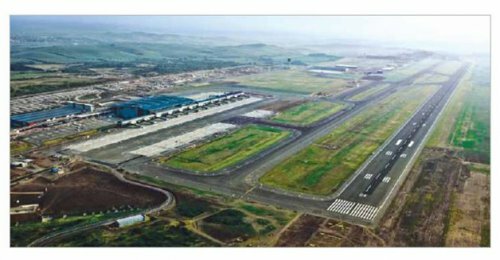 The development of airport precincts that utilize available municipal land for industrial, business and other ventures thereby growing the local economy and generating new jobs. There is a growing recognition by key municipal officials that, with assistance, airport problems can be solved. A network of regional airports will provide a service for air route systems operated by private air carriers, offering scheduled, shuttle and charter air services, and public organisations delivering emergency air medical, security and disaster management services. Regional airports need to be interconnected and linked to a central hub. The regional airports provide a service to airlines moving passengers and freight within KwaZulu-Natal, and to major hubs such as KSIA and ORTIA. The KZN Aviation Strategy should be an essential part of the KZN Integrated Aerotropolis Strategy. Initially, there may not be sufficient private, passenger or freight, demand for air services between all these airports to support a regular air service. However, in the public sector, the KZN Department of Health operates an Emergency Air Support and Doctor Outreach programme based on a set aircraft schedule. This could become a scheduled service foundation for a wider service within a framework of contracts with state enterprises such as the Post Office, Telkom, Eskom, DWAF and KZN Tourism needing connectivity to regional centres. Economics will play a role in determining the success of a KZN Aviation Strategy. However,The demand for air services not only depends the relative price of an air ticket, personal income levels and preference for different modes of travel but also on the safety, security, reliability, connectivity and time saving associated with air travel. On the supply side, financially sustainable operations on regional air routes require the flexibility of much smaller aircraft than conventional low cost carriers. These aircraft operate at higher per passenger cost and may not be able to offer ticket prices that meet the expectations of potential air travelers. The right balance must be found between demand and supply. Airports create business opportunities that can be exploited to promote local economic development and generate nonaeronautical airport revenue. This includes retail space, parking, rental cars and advertising. Municipalities own land at or around local airports. This land is a valuable asset that can be utilized for industrial, agricultural, business and even residential purposes. Land zoned appropriately, and made available to the private sector for development will generate substantial funding for the provision of airport revitalization and infrastructure. Development of airport land provides an outstanding opportunity to attract potential projects such as innovation and technology hubs, aviation clusters, transport related industries, agricultural processing, aviation education and training centers", manufacture of sports goods, hotels and conference facilities. There is a need for planning activity that stands back from the on-going operations and takes a longer term view of growth and coordination of regional aviation. Consequently, the KwaZulu-Natal Aviation Strategy proposes that an umbrella body, the KZN Aviation Agency (KZNAA) is formed to take its aims forward. The Agency will be responsible for the preparation and implementation of master plans, dealing with environmental issues, planning and delivering new infrastructure, research and forecasting, liaison with air carriers in planning new air networks and feeder routes. In order for the vision of the KZN Aviation Strategy to be realised it is necessary to obtain the required "buy in" from all the municipalities, government departments and other aviation stakeholders. Without such cooperation the goal of growing air services and connectivity in the province will not be achieved.